Coronary artery disease (CAD) is a leading cause of death in men and women, although historically there has been more of a focus on its importance in men. Biological differences between the sexes impact on the nature of the disease in men and women, with implications for diagnosis and management. Furthermore, the unique hormonal changes resulting from pregnancy and the menopause require special consideration when managing CAD in women. While CAD is a killer of both sexes, women are proportionally more affected, with it accounting for more deaths than from cancer, chronic respiratory disease, Alzheimer’s disease and accidents combined. Although overall mortality had been in decline, the rate of CAD in young women has been increasing since 1980. In this chapter we explore the special considerations that need to be taken into account when managing CAD in women who go on to require percutaneous coronary intervention. Collaborative overview of randomised trials of antiplatelet therapy Prevention of death, myocardial infarction, and stroke by prolonged antiplatelet therapy in various categories of patients. BMJ. 1994;308(6921):81–106. https://doi.org/10.1136/bmj.308.6921.81. 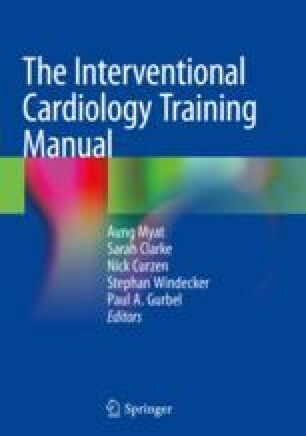 Randomised trial of intravenous atenolol among 16 027 cases of suspected acute myocardial infarction: ISIS-1. First International Study of Infarct Survival Collaborative Group. Lancet (London, England). 1986;2(8498):57–66. http://www.ncbi.nlm.nih.gov/pubmed/2873379. Accessed March 7, 2017.